Understanding how to make a simple wire loop is an important basic wire working skill. It can be used to make wire findings such as eye pins, loops to make bead dangles or to make bead connectors for a rosary style bead chain. Practice is important to make the loops round, even-sized and centered on the wire. Simple loops can be made with most types of wire depending on the purpose they will be used for. For this example, 20g half hard sterling silver filled wire is used. Simple loops will be more secure if you use half hard wire rather than soft wire. Start with a piece of wire appropriate for what you are making. 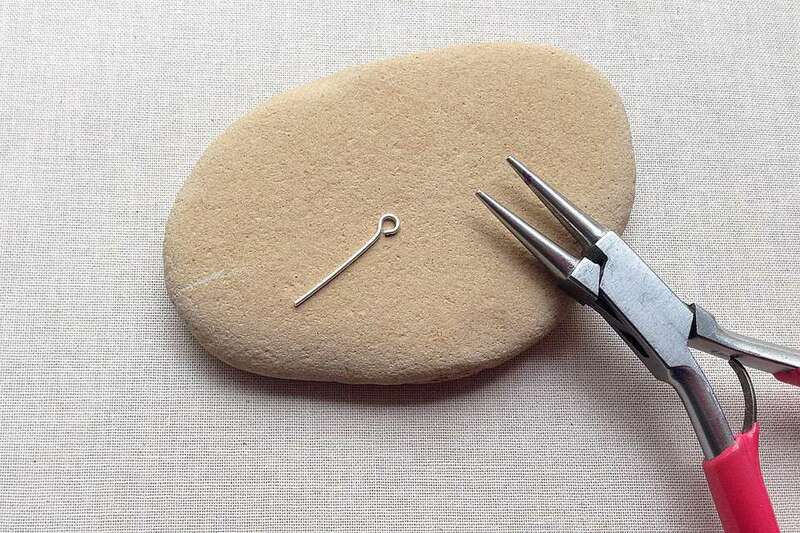 To make an eye pin, a 1 1/2 or 2-inch piece of wire is a good size. In order to have a round loop, it is important that you start with you wire properly aligned inside the jaws of the plier. Align it to the top edge between so you can barely feel the edge of the wire if you pass your fingers over the top. If the wire pokes you when you rub your finger over the top, it is too far out. If you can't feel the edge at all, it is too far down between the jaws of the plier. Note that I have already made a mark where I want to make my loop on the plier using a permanent marker. This helps to make all of the loops approximately the same size. Wrap the wire around the round nose plier. You can do this by turning your pliers and rolling your wrist BUT you may strain your wrist if you do this motion repetitively. I find it better and easier on my hands if I try to keep the hand holding the round nose plier still and use the other hand to push the wire around the barrel until it is wrapped as far around as it will go. Make sure the wire is pushed flat against the plier to get a perfectly circular loop. In order to completely close the loop, reposition your pliers and make a final small turn so the cut wire end is flush with the edge of the main wire and forms a complete circle. Remove the loop from the plier and you will have a round circle loop but it will not be centered on the wire. There is one final but very important step to centering the loop on the wire. The step to center the loop is often referred to as breaking the neck of the wire. It makes sense if you think about the wire loop as a head on the wire. You need to adjust the neck by making a bend at where the wire meets the loop so it can sit in the center. To do this, insert your round nose plier at the base of the loop and pull the wire away from the open end of the loop just a little. You can do this a little at a time to make sure you don't over adjust it. Once the loop is centered on the wire, your eye pin is done. You can make a bead connector by adding a bead and making another eye loop on the other side of the bead. If you find that it is difficult on your wrist or hands to make simple loops, or that you have difficulty making them an even size, you may find it easier to use a 1-step looper plier.